One of the most basic decisions which has to be made before starting a recording project is whether or not you are going to use a click as a timing reference. If you are recording a group of musicians all at the same time there are plenty of reasons why using the drummer as the timing reference is a good idea. After all, plenty of classic recordings have been made in this way. If the band are tight, the drummer is good or the band are unused to playing to a click I would often recommend avoiding using a click. If the recording is being made by overdubbing many parts on top of each other then the use of a click becomes more necessary, you can do it without but all too often the results can have a sense of “timing by committee” - never a good thing. The new Click II plugin was introduced in PT11. Apart from a new UI it differs little from the old Click plug-in other than it offers more control over the choice of sound and the note values of the the accented and unaccented clicks. Using the follow meter button (on by default) the accented click will fall on the downbeat and the unnaccented click will follow the value set in the meter change window which is opened when creating events on the meter ruler. If set to crotchets/quarter notes (the default) then in 4/4 you would get the expected “ONE two three four ONE two three four”. If set to minims/half notes the count will go “ONE two ONE two” and so on. Unchecking the Follow Meter button allows greater control of your click. For example set up your click to the settings in the image above for a convincing bossa nova. To set up a basic click track just go to “Create Click Track” at the bottom of the Track menu. This will set up a default click and to enable it, check the button on the transport window with a picture of a metronome on it or press numeric 7. To set up a count-off (the click plays for a specified number of bars before recording begins) click the green Count Off button on the right of the transport window or press numeric 8. The number of bars of count off is displayed next to the button but to set up your Click/Count Off Options go to Setup > Click/Count Off Options or click on the count off amount or the click button in the transport bar. The options window allows you to set up a MIDI device to use for a click and more usefully allows you to set up Count Off so it only counts off in record, it will drive you mad if you leave it on in playback! These days using MIDI hardware to generate a click is hard to justify. I can’t see any reason to do it (MIDI to DMX conversion to make the studio lights flash in time?) but you can address any internal MIDI node from the click options window so if you really want to create a Structure patch of your old music teacher shouting “one two three four” it could be done. On the subject of choosing click sounds, sound choice really can make a difference to the quality of the results. I work with a drummer who is very particular about his click. He likes small subdivisions to “fill in the gaps”. Instead of “ONE Two Three Four” he’d prefer “ONE and Two and Three and Four and”. This is particularly helpful when working in compound time signatures although using follow meter and Click II isn’t very successful when setting up a session in, for example, 12/8. By default it will work with crotchet/quarter note subdivisions and the result would be a count of “ONE two three four five six ONE” etc. Tweaking in Click II doesn’t really help, in fact it often results in bizarre results. Sometimes its helpful to take control of your click. Choice of sound is also important. The drummer mentioned earlier prefers softer sounds such as shakers rather than hard ticks or plips. Not only is a shaker easier on the ears but bleed can be an issue, particularly if the player has a mic close to their head (for example an over the shoulder to capture the player’s perspective on drums or acoustic guitar). 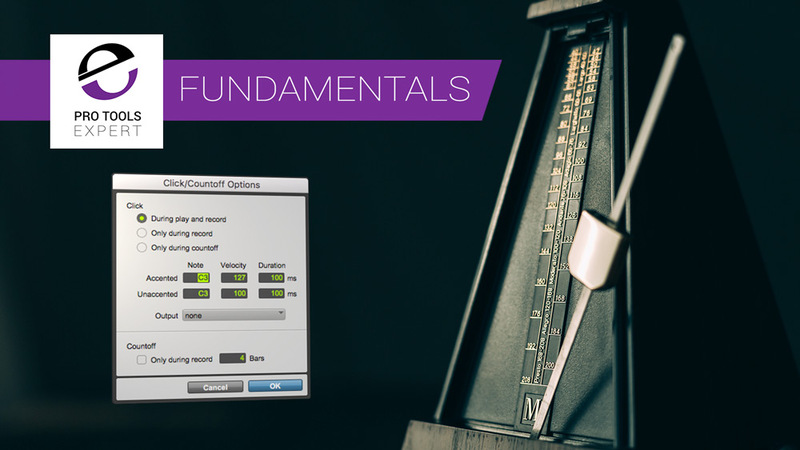 Automating or muting the click can be useful in particularly quiet sections and I have always favoured the use of the Big Counter in Pro Tools to provide a visual timing reference during sections where a click is unsuitable. After all, orchestras have been watching a conductor’s baton for years. If I want a specific click, often the quickest way to get it is to use Boom by inserting Boom on an instrument track and creating a pattern which can be triggered by placing the correct MIDI note on the instrument track (for pattern 1 it would be C1). Being tick-based it will follow tempo changes. Using Boom like this can be very convenient. For even greater control the MIDI editor can be used but I have found a far more convenient way to get your click set up is to use audio clips. Short, single beat clips placed on tick-based tracks are just as flexible as a MIDI click and if you are more comfortable working with audio then it will work every bit as well. If you are presented with a request which is proving difficult to achieve, for example a particular groove, shuffle or swing which can take time to set up and get just right, I have found a quick way to get around it and stop the pace of the session from stalling is to record someone playing a few bars and to create a loop. A good example of this happened recently when I was working with an artist who wanted a particular rolling shuffle rhythm instead of a straight click. Instead of trying to program a suitable rhythm I recorded him drumming with his hands on his thighs, trimmed a good sounding loop and copied that across the session - job done!